You’ve probably heard the line about how the Eskimos have 40 words for snow. Or perhaps when you heard it, it was 9 or 25 or 100 or 400. The idea that the “Eskimo words for snow” trope is generally intended to illustrate is that language reflects what people find important, that a culture that concerns itself more about all the different nuances of snow has more words than a culture for which snow is just snow. Strangely enough, the “Eskimo words for snow” line has taken on a life of its own as something like an urban legend, but in fact it’s not really true, and not really meaningful. Let me break down the issues. First of all, there’s no such thing as “the Eskimo language.” There are at least six languages and numerous dialects in the Eskimo-Aleut language family, with three main branches. So the first question would be, in which language are we counting the words for snow, because the number will vary from language to language? But suppose we pick whichever one has the most snow words, just to keep things interesting. The next question is, what’s a word? Yes, your first reaction may be that everyone knows what a word is, but in fact it’s pretty complicated. To look at the English word for snow, would we count snow, snows, snowing, and snowy as separate words? Because there we have 4 already and could quickly add many more. So perhaps we say that what we mean is roots or lexemes, the basic units related by meaning. Thus all my variations and derivatives of snow count as a single “word.” But now what about snowflake, snowdrift, and snowstorm? Are these derivatives from the same root, or separate words for our count? And does it really matter? If I use the word snowflake while a speaker of another dialect of English uses the word flingle, do I have fewer words for snow? And even more substantively, is snow less important to me, or is my understanding of snow less nuanced because my word for flakes shares a root with my other words for snow? To carry that point farther, languages in the Inuit-Yupic-Aleut family are generally polysynthetic, which means that lots of aspects of meaning are built up by adding affixes (in the case of Eskimo-Aleut languages, almost exclusively suffixes) to roots. This is different from English, which mostly leaves its root words alone and uses separate words such as prepositions and adjectives to build up meaning. And that means that in Central Alaskan Yupik, for example, there can be almost infinite variation in a single “word” in the same way that English can create infinite variety by combining separate words into sentences. So for our example, where English might talk about dry powdery snow, fine cold snow, fat clumps of falling snow, good packing snow, wildly whirling blown snow, and the crust on the top of snow where it’s melted slightly and then frozen again, in Central Alaskan Yupik each of those noun phrases might be rendered as a single “word.” So, do we count each of them in our tally? Perhaps we’d better remind ourselves once more to stick with root lexemes. Then the next question is, which lexemes actually count as snow terms? For example, English has, in addition to snow, ice, slush, frost, and hail. Are those all “words for snow,” or are they each something slightly different? Personally, I’d probably count slush, but not the others, but it’s surely a matter of opinion, and it would make an enormous difference to the number of words included in any list. Considering each of these questions and including only lexemes that definitely denote snow, most of the languages and dialects in the Eskimo-Aleut family include words derived from three basic roots for snow: *qaniɣ “falling snow”, *aniɣu “fallen snow”, and *apun “snow on the ground”. I confess that I’m not sure what the difference would be between “fallen snow” and “snow on the ground,” but leaving that aside, what we end up with is that the Eskimo-Aleut languages have as many as three words for our one word snow. Okay, so this isn’t the 40 or 400 words for snow of the urban legend, but still, clearly the Arctic peoples do differentiate their snow more carefully than speakers of English, and that’s significant, right? Well, not really, because… well, because duh! After all, every group has lots of specific words for the things it needs to differentiate. Painters have many more different words for types of brushes than non-painters, doctors differentiate every individual muscle by name where your average couch potato doesn’t, people who deal with horses have all different words for the horses’ anatomy and equipment, sailors have words for all different kinds of knots, botanists have words to describe the different shapes and structures of leaves and flowers… So, do “Eskimo languages” have lots of different ways to describe the different significant features of the snow and ice they live with? Of course they do, but this really doesn’t tell us anything special about language or culture. People talk about what’s in their lives and what’s important to them. Well, duh. “foreign” to most speakers of English, but which do show up in my dictionary and are used by English speakers who discuss such things, which after all, is what this is all about: discussing snow. The great blizzard of 2015 has struck, and while it actually hasn’t been too terrible here where we are, it’s certainly very snowy! School is off, the driveway is covered and the street not much better, and we haven’t lost our electricity, so all is good. 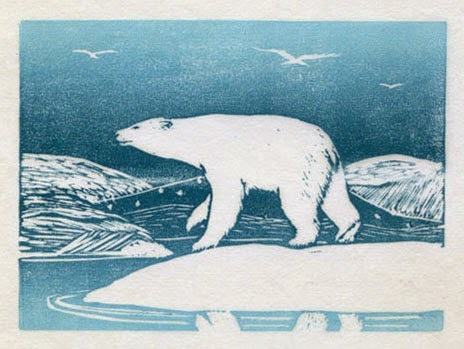 To celebrate, here’s a great wood block print of a blizzard. This is by Charles Turzak (U.S. 1899-1986). Swirling modernist lines look out of place in some pieces of art, but they work well here to show the blizzard’s wind. 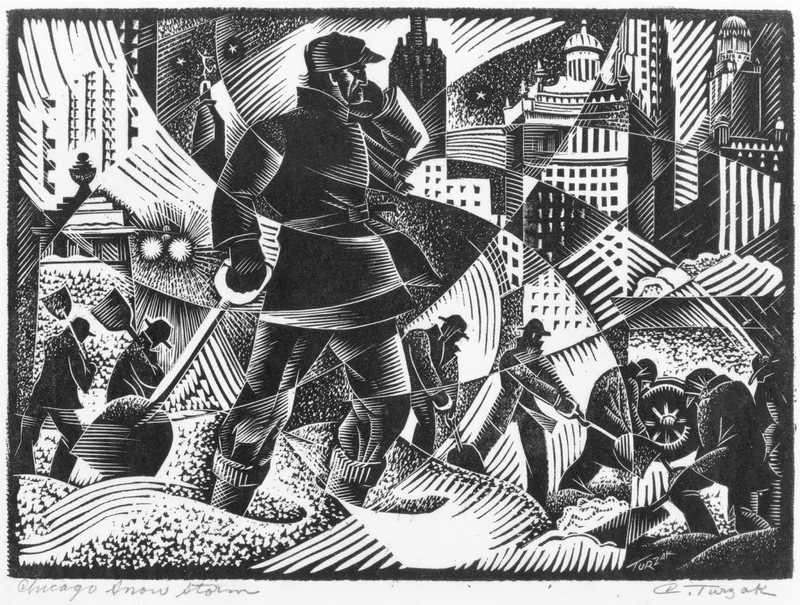 I like the texture of the snow around the central man’s feet, and the blaze of headlights in the center left. I’ve got a number of quiet scenes with beautiful, peaceful blankets of snow, and I’ll share some more of those in the next few weeks, since our snow won’t be going anywhere soon. But right now the wild, blizzardy chaos of this one is wonderfully exciting. In December we went to a special exhibit at the science museum about the Maya, and there I discovered that the Maya did some relief block printing. This first block is shown beside the image it would make when printed. I like the two little monkeys and the apparently more abstract design below. (If I remember correctly, this is not a huge stamp: maybe about 2 or at most 3 inches tall.) It and the others in the top row of the second photo are single small, flat stamps which were made by pressing clay into molds. The exhibit didn’t tell whether the molds were made from wood, stone, or some other material, but in any case this production method would have some interesting implications. First of all, the design to be printed would be carved into some sort of block, meaning that what you carve will eventually be ink-colored, just like intaglio printing and the opposite of most relief printing, since the clay pressed into the mold would then result in raised areas where the mold had engraved areas, which would then be covered in ink and relief printed. Secondly, not only could each printing block make multiple impressions, but a single mold could create multiple printing blocks. This is not a system designed for limited editions! And what were these blocks used for? According to the information written below, “the raised and decorated areas could be pressed onto cloth, paper, or even human skin.” I don’t know what evidence the archaeologists have (if any) for how these stamps really were used by the Maya, as opposed to how they could have been used. There were no examples of printed cloth or paper on display, but of course such things might simply be too fragile for display. The stamps in the second row are roller stamps. According to the blurb, “the Maya covered cylindrical stamps with paint and then rolled them onto cloth in order to transfer the designs. Stamps such as these indicate that stamping was common during the Classic Period. Today, Maya women weave similar designs into textiles instead.” There are a couple of interesting questions this small blurb raises. Firstly, the archaeologists clearly view these as stamps rather than cylinder seals like those of the Sumerians. (See my post on the earliest block printing. Note, too, that if the flat stamps were actually printed on paper, the earliest of them might predate the earliest extant paper prints from Asia.) Again, I wonder whether any ancient printed textiles actually exist, or whether they are merely assumed. And secondly, it seems odd to me to go from printed textile designs to woven. 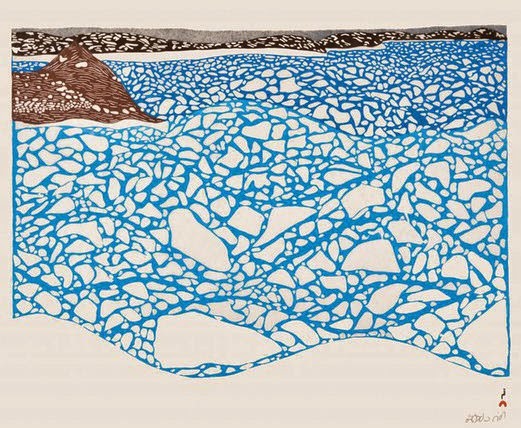 I would have expected the progression to go the other way - designs made in more complex methods would over time be adapted to the simpler reproduction method that is printmaking. In any case, despite my questions about how these printing blocks were actually used, I got a kick out of discovering them. Yet more proof of the universality of the concept of relief printmaking. Yes indeed, everybody loves block printing! 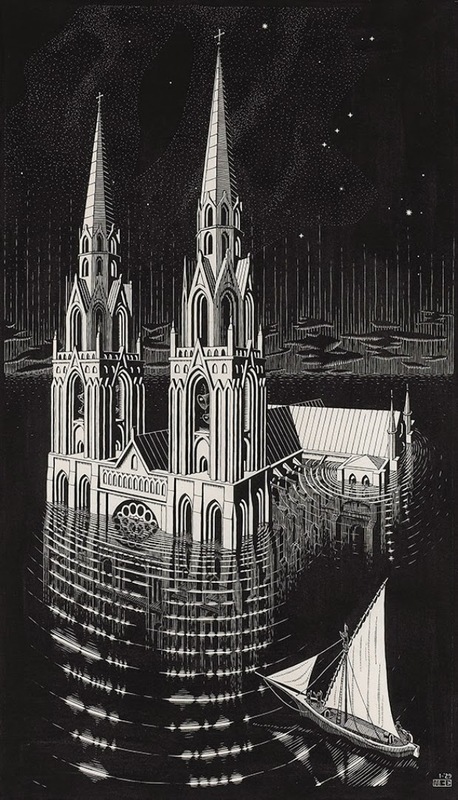 I’m not one of those people who believes that “perfection is boring.” I admire and enjoy the perfection of Escher’s carving, just as I admire and enjoy other endeavors in which people strive to do the best possible job they can. But all the same, sometimes it’s nice to see that everyone makes mistakes, and that mistakes don’t necessarily spoil everything. While I was at the Escher exhibit in Manchester last month, peering closely at M.C. 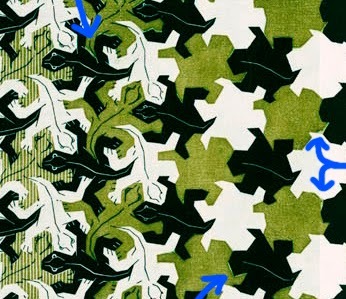 Escher’s amazing and pretty much perfect wood block prints, I was tickled to see that on one of his biggest, most famous pieces, the registration was slightly off. Registration is the lining up of the printing of separate blocks on a single piece, and whenever I’ve done reduction prints that need to be printed in multiple layers, registration has been my nemesis. So I took heart to see that a) even someone whose work is as perfect as Escher’s doesn’t always get things lined up perfectly. And b) it didn’t matter. The piece is amazing. Here’s a fun addition to my fantasy menagerie, and something that was completely new to me. All I know about it is what I came across while looking up something else, so I make no claims to understanding the history, literature, and cultural nuance of this bit of Japanese folklore. I simply was tickled by the idea. And the basic idea is that household objects, after a long life of service, receive souls and become animate. Usually it takes about a hundred years, and often it involves a long period of neglect before objects come to life. Apparently sometimes stories about these objects were told to teach elements of Buddhism, sometimes their message is to discourage wastefulness, and sometimes they’re merely considered mostly harmless and mildly prankish. What delights me about this idea is the seemingly random list of Tsukumogami known from legends and stories. They include possessed or animated sandals, bedding, paper umbrellas, tea kettles, mosquito netting, graters, musical instruments, and lots more. 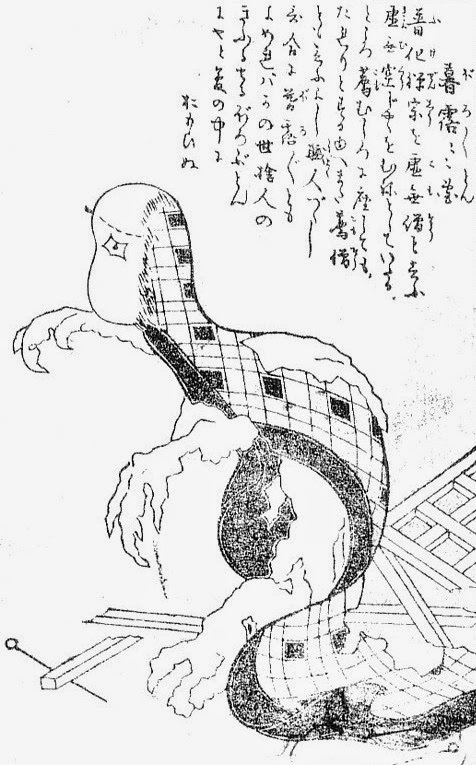 The Bakezori, a possessed straw sandal, uses his life to scamper around all night chanting "Kararin, kororin, kankororin, managu mittsu ni ha ninmai!” which is apparently meant to mock the more prestigious wooden sandal. The Boroboroton, or animate futon, on the other hand, is downright murderous. In the middle of the night he will throw his owner out of bed and begin to wrap around the sleeper’s head and neck in an attempt to strangle him. The umbrella spirit, or Kasa-obake, is a relatively modern creature, not appearing in any of the older folklore, but it’s one of the most well-known and popular today. It has one eye and jumps around on one hairy leg. will play by themselves the tunes that former owners used to play, or which were especially poignant, and the sad Abumi-guchi, stirrup-mouth creature, waits forever on the battlefield for its dead soldier to return. But most Tsukumogami are less patient with neglect. They search out other Tsukumogami and either throw boisterous parties together at night, or run away from home together. 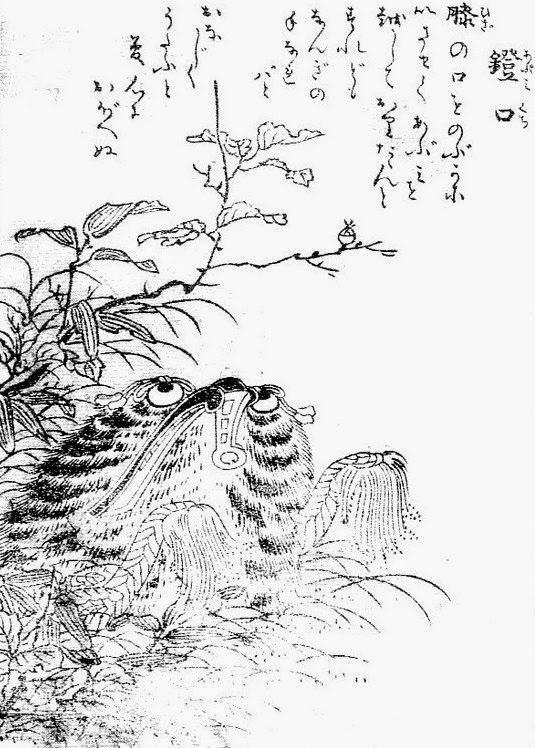 Always excepting the murderous futon or the possessed roll of cotton, which will try to smother travelers, I think it would be quite interesting to meet a wandering Tsukumogami. Naturally my imagination tends first toward something like Lumiere or Mrs Potts from Disney’s “Beauty and the Beast,” but I think Tsukumogami are an idea with a lot of different interesting possibilities for fantasy. As promised, I have more M.C. Escher for you today, and this time I’ve chosen some fantasy pieces. 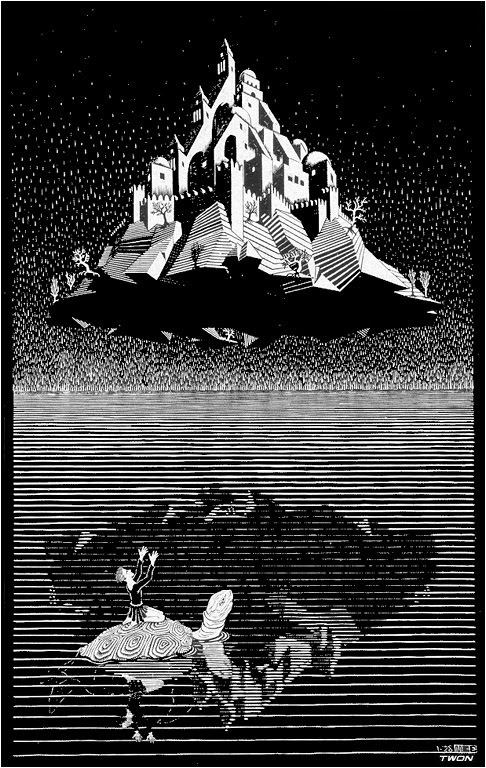 Of course in some ways fantasy themes (broadly defined) appear in a high percentage of Escher’s work: all the pieces with strange creatures, all the pieces with impossible topography, all the pieces with transformations, odd juxtapositions, and counterfactual elements. But I’ve selected a few pieces that show scenes of pure fantasy. Still Life and Street is a classic fantasy world: books becoming buildings, or some some juxtaposition of scale. 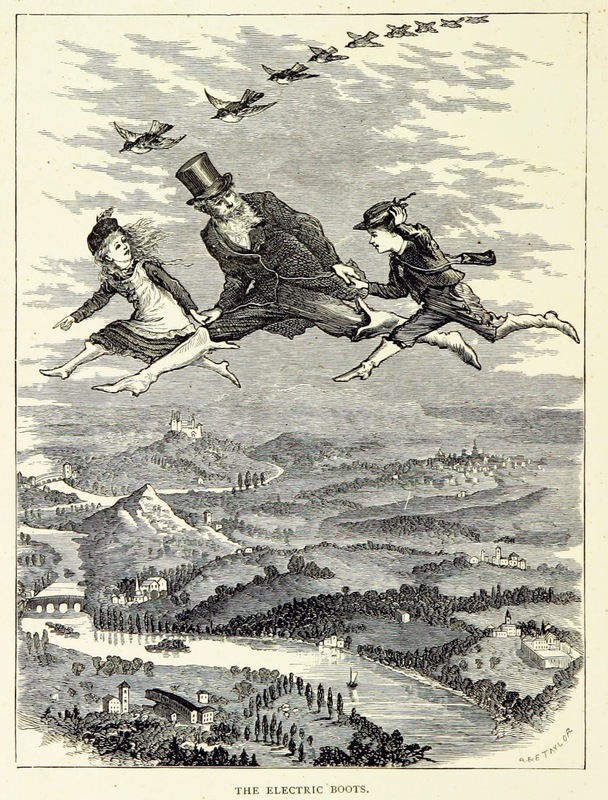 It makes me think of E. Nesbit’s story “The Town in the Library in the Town in the Library,” although Escher’s picture clearly shows the library town of a grown man rather than one built by naughty little children. As always, Escher’s wonderful details add to the magic, from the patterns on the books to the flowers in the windows, and the laundry lines all the way down the street. Notice the perfect shadows that the plants on the roof cast onto the wall opposite! I’d love to do this theme myself some day, although I’d have to come up with some twist to bring something new to the concept. superimposed on the shadow of the turtle’s bottom and flippers visible beneath the surface. 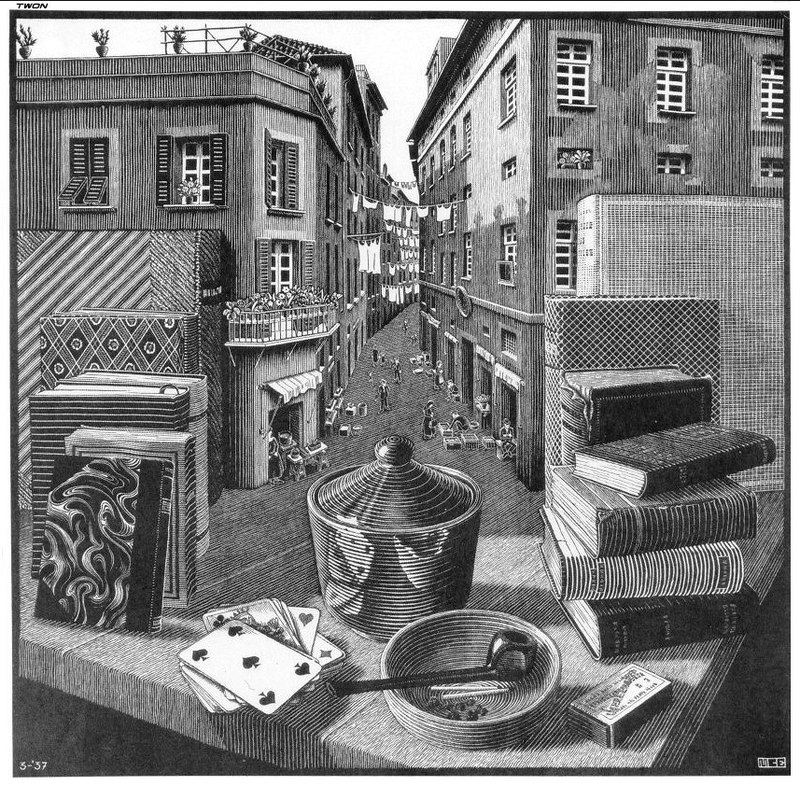 This was an idea Escher would come back to in 1955’s Three Worlds.) 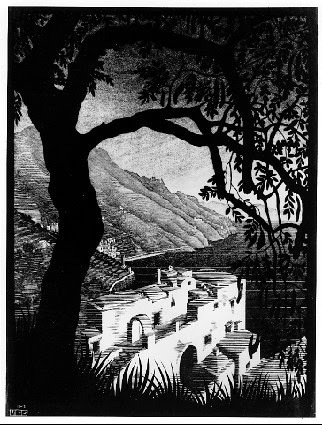 This is one of Escher’s earliest pieces in which he was exploring the landscapes of his imagination rather than the real world. …creation is embarrassing. For every new good idea you have, there are a hundred, ten thousand foolish ones, which you naturally do not care to display… The world in general disapproves of creativity, and to be creative in public is particularly bad. Even to speculate in public is rather worrisome. The individuals must, therefore, have the feeling that the others won’t object. I think he’s pinpointed a couple of important things here. First, that although all the world loves a success, it is generally not very impressed by the steps that lead up to that success. Every great idea comes after a long trail of discarded ideas, but while being the genius who puts forward the winning idea is respected, putting forth all the preliminary ideas that lead to it is not only not respected, but often actively discouraged. So how do we carry on with our own creativity in the face of potential embarrassment? Mostly by keeping our ideas to ourselves. And how do we teach and encourage creativity? By trying not to mock, of course, but even more importantly, by giving room for private thought and permission for solitude. So the second point here is that we can’t be creative if we’re always in a public jumble of other people, without the chance to work through our own series of foolish ideas, quietly combing out the few precious strands. Asimov makes a third point, however: that group work can be enormously helpful in multiplying the fund of knowledge that can then potentially be combined in new, unexpected ways. I know that I’ve often benefitted from running half-baked thoughts past tolerant family members. They respond with the facts, ideas, fancies, and questions that occur to them, which are inevitably somewhat different from those that had already occurred to me. But, Asimov asserts, this process only works in a group in which “all people at a session be willing to sound foolish and listen to others sound foolish.” This requires a special kind of people, and a special kind of group dynamic. Many a highly intelligent person has squelched their ability for creativity through too deep a concern for respectability making them unwilling to sound foolish. Many a highly eccentric person has squelched the creativity of others through too deep a concern for their own colorful self making them unwilling to listen to others sounding foolish. So what does creativity require? Silly people willing to spend time with their own silly thoughts, punctuated by time spent being silly together. Perfection! Therefore I challenge you: have you been silly today? Quotations from On Creativity, by Isaac Asimov, c 1959. You can read Asimov’s full essay at MIT Technology Review. Last week I was lucky enough to see the M.C. Escher exhibit at the Currier Museum of Art. According to their blurb, “This Escher retrospective [was] one of the largest and most comprehensive ever offered in the United States.” Certainly it was big, and had, in addition to much Art, lots of interesting stuff including sketches, blocks, and proofs that shed light on Escher’s process, and his development of themes and techniques over the course of his life. I enjoyed it very much and came away with a number of things I noticed that I want to feature in upcoming blog posts. 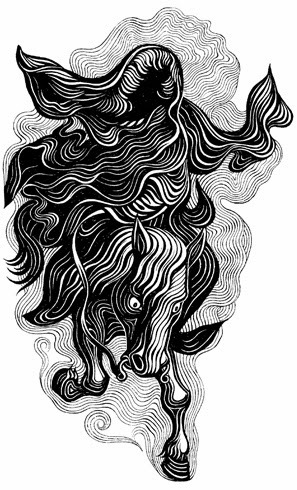 Today I’ll share something I found interesting about Escher and his greys. Of course Escher did lots of lithographs, in which you find the same sorts of gradations of grey as in a pencil sketch, and he did some mezzotints, in which you can get some of the richest shades possible in any printmaking technique, but as always I’m going to focus on the wood block prints. 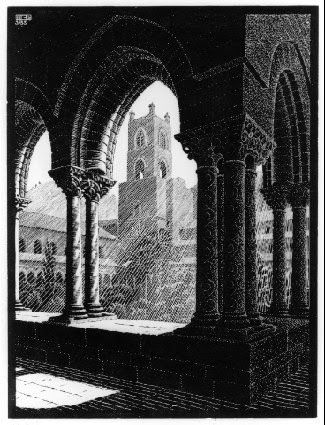 Escher did lots of pieces with multiple blocks, even for images that were simply “black and white.” That’s because he often wanted black, white, and one or more shades of grey, too. Sometimes his grey blocks were printed with grey ink: that is, ink that was presumably a mix of black and white pigments. But the thing I found interesting and unexpected was that in many prints Escher appeared to ink his “grey” blocks not with grey ink but with black ink spread so thinly that the white paper showed through and made it read grey. This is the sort of thing that’s hard to see in a reproduction on a poster or in a book (or, I’m afraid, a computer screen), so it was one of those revelations that come from seeing the art in person. All three of these pieces posted here have a related composition, with the misty grey scene in the background, framed in a black silhouette almost like cut paper in the foreground. As an idea for a multi-block piece this is really inspiring me and I’d definitely like to try for myself something with this concept. Escher, of course, takes an idea that I might toy with and pushes it to the extreme. This third piece, for example, is made from not just two blocks, but black plus five greys! I could barely even pick them all out while looking at the original. 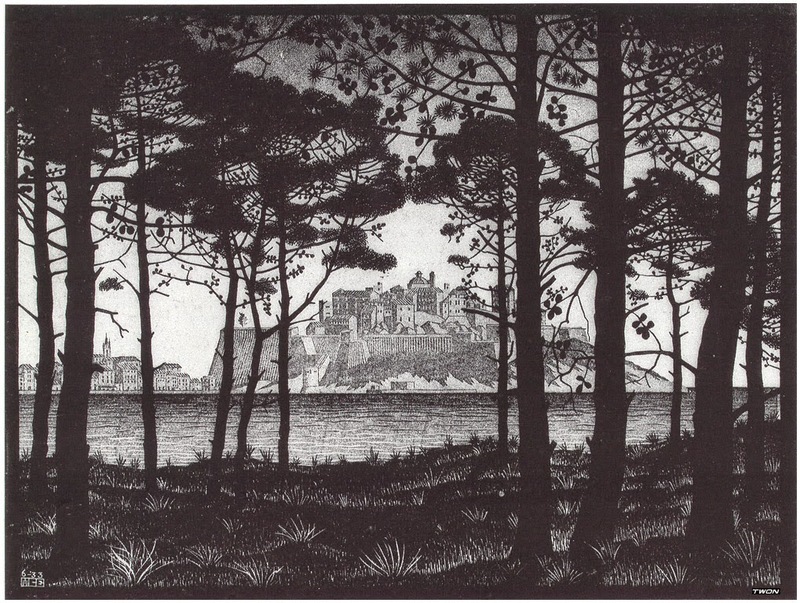 Looking at Escher’s work makes me feel dreadfully lazy - the talent and skill are obvious, but the sheer amount of dogged work he put into his planning, carving, and printing is mind-boggling. One more note regarding the printing of these pieces: it was the norm for artists not to print their own blocks but to have them printed or “published” by professional printing studios. Escher did do a fair bit of his own printing and was proud enough of himself for it that he marked self-printed pieces “eigen druck,” which translates basically as “own printing.” But I did not note in the exhibition whether these particular pieces were “eigen druck” or not. I think getting the level of grey correct would be pretty tough, since the grey comes from the rolling of the ink rather than mixing ahead of time. I’m guessing that means Escher was more likely to get the professionals to do it, but perhaps it means he would prefer to do it himself to get it exactly the way he wanted. While these illustrations are, I believe, simply pen and ink, they have a definite block print vibe, with nice solid black blacks and white whites. They were apparently “redrawn” by Eric Fraser for a 2002 reissue, but I really don’t know what that means or what “redrawing” accomplishes. 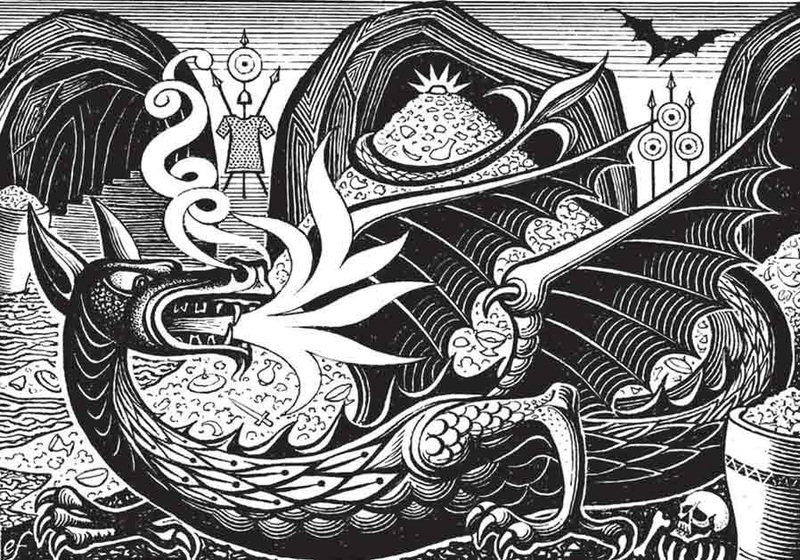 As Tolkien himself noted, Margrethe’s illustrations have a certain similarity to his own, especially noticeable in the picture of Smaug on his hoard. (I don’t know whether Margrethe had seen Tolkien’s pictures when she did hers.) There’s a certain stylized whimsy without being cutesy that seems appropriate, especially for The Hobbit, which isn’t nearly as serious or epic in tone as The Lord of the Rings. But the Nazgul is pretty cool, too!